INDUSTRY.co.id - Medan - National Measles Immunization and Rubella Activities implemented by the government should not only be prioritized in the leading and outermost areas or 3T, but also for the poor in urban areas. "The purpose of the immunization is to prevent the disease that will attack the child is still small, and the mother is pregnant again," said Lecturer of the Faculty of Medicine, University of North Sumatra (USU) dr H Delyuzar Sp.PA (K) in Medan, Saturday (12/08/2017). 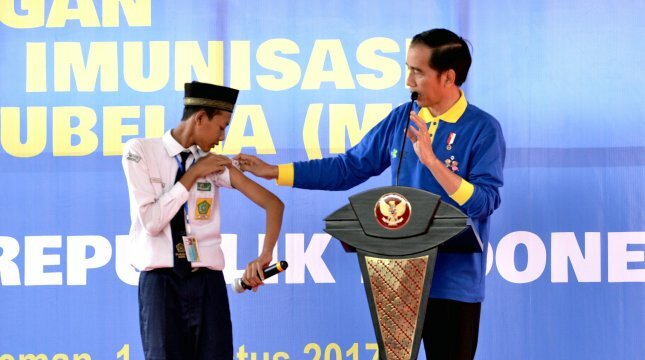 In addition, according to him, through the immunization program, the people of Indonesia will be free from diseases that have been feared by the public. Moreover, rubella generally affects children and adolescents; it must be prevented so it does not grow widely in the community. "In Indonesia itself, based on the results of Basic Health Research (Riskesdas) that there are more than 400 cases of rubella recorded in 2011," said Delyuzar He said the immunization program implemented by the government through the Ministry of Health, should be supported by the community so the program to save Citizens of measles and rubella run successfully, safely, and do not experience obstacles. "The community is also expected to help socialize immunization activities carried out in rural, suburban and mountain areas that have been difficult to reach the immunization team," he said. Delyuzar said the central government is big enough to pay for the immunization activities so it must succeed in rescuing people from measles and rubella. The government also hopes that citizens can be free from rubella disease, because the virus is easily spread through the saliva granules in the air that is released through the cough. "Then, through food and drink in the same dish or glass with the patient can also transmit the rubella virus," he said. He explained that congenital rubella syndrome can cause birth defects in infants, such as deafness, cataracts, heart disease, brain damage, liver organ, and lung. Children who have been immunized with polio injections should not be afraid of further immunization against measles and rubella. This, it will not be harmful to health and stay safe. "The Ministry of Health also ensures that the use of measles and rubella immunization is no problem," he said.